Grilling is part of life for most of us, but cleaning the grill can be a challenge. The best way to tackle this job is with a good tool. I recently put the Great Aussie BBQ Grill Brush to this test. I was immediately impressed with the size and weight of this brush. It’s handle is quite sturdy and a full 18″ long, making it very usable. The brush itself is a 3 sided brush head 7 inches wide with bristles extended 2 inches around edge of brush–it has more bristles than most I have used before and they are made of stainless steel, rather than the traditional brass. Cleaning a grill is not like rinsing out a stove top pot and this brush looks like it might stand up well to the task. 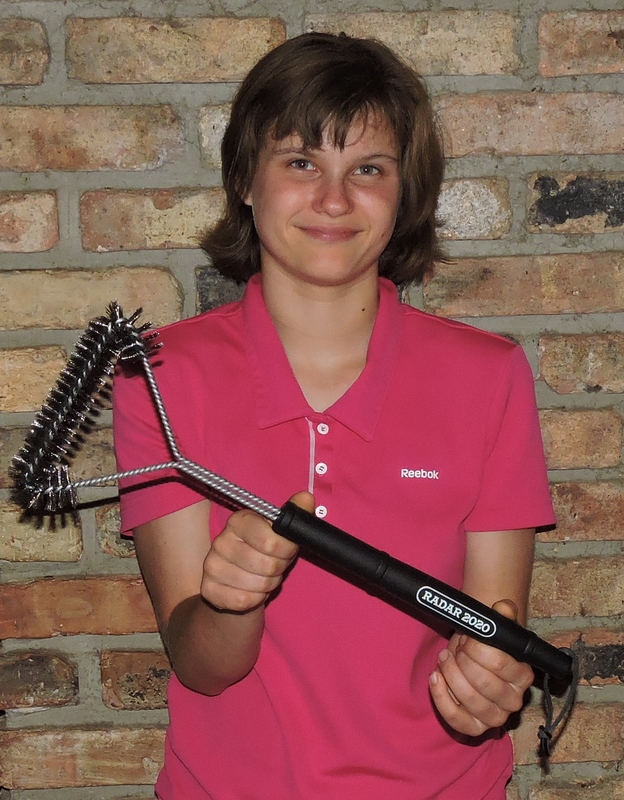 But as regular readers know, I highly value function over looks and for me to recommend this grill brush, it must be able to clean a dirty grill. We live in Florida where grills are often part of an informal outdoor kitchen. My father uses his grill daily, choosing to enjoy the outdoors over heating up the house. His grill, with its constant use, would definitely be a good test for any BBQ grill brush. Although much debris is burned off the grill as it is used, there is always a substantial amount remaining that needs to be cleaned. The brushes I’ve used in the past did a good job, but required a great deal of my effort and honestly need replacing quite frequently. The Great Aussie BBQ grill brush does require a little arm power, but it is sturdy enough to stand up to a strong amount of elbow grease! It’s definitely proportioned and shaped correctly to reach in and around our larger grills. But the biggest “wow” comes from the way it actually cleans the grill area! The heavy concentration of stainless bristles scours through the built up residue and sent it in tiny bits to the bottom of the grill. It indeed cleans as it claims. Now I have a dirty grill brush. I was pleasantly surprised at how easily the brush cleaned. A quick rinse with the water hose and it was ready to hang up to await it’s next use. After testing this brush, I can highly recommend it. I expect it will continue to perform well for a long time. A further vote of confidence: it’s sold with a ONE year money back guarantee.